Agricultural land in Ukraine is one of the best mid and long-term investment opportunities in the world. While many arable land plots worldwide get deteriorated by intensive conventional (chemical) farming practices, Ukraine’s black soils, aka Chernozem, have managed to stay much less harmed by humanity’s most dangerous and delusive “inventions”: toxic pesticides and synthetic chemical fertilizers. Ukraine’s diverse farming climatic zones provide an exceptional opportunity for fully-diversified, complete-cycle farming ventures with their own livestock, seed production and premium field crops and row crops production of export-scale harvest volumes. Calculated per annum with fuel, spare parts, seeds, fertilizers, crop protection, labor costs, etc. included, annual cultivation cost from USD 200 per hectare using organic farming methods up to USD 500 per hectare with conventional/chemical farming. Organic farming, as opposed to intensive conventional farming, provides a better investment opportunity in Ukraine due to high natural fertility level in the soils. In most of the cases, there are no yield losses when growing organically in Ukraine compared to what most of the Western European farms experience during the transition period. 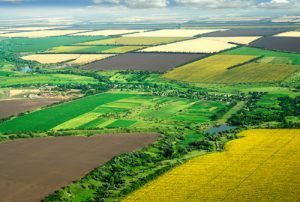 How to Invest in Agricultural Land in Ukraine? Agricultural land investment made easy: InvestUkraine agriculture experts can provide you with further information and details on how to practically realize agriculture land investment opportunities in Ukraine. Please contact us for more details.